The client is a top Original Equipment Manufacturer (OEM) that specializes in RSA Fuel Injection Systems. As a manufacturer of fuel control systems for various aviation related equipment, the client works with new, rebuilt, or overhauled fuel injection systems. The client also supplies these systems to be installed in new aircrafts. With customers from across the globe, the client has made a unique presence based on fuel related parts that help save cost in terms of fuel as well as performance. Having worked with airmotive industry for over two and half decades, the client provides fuel control systems to many top airlines. The client wanted to convert some of its critical fuel injector designs into the 3D AutoCAD files. The legacy conversion of these designs required an engineering services partner with ample experience in serving the aviation and airmotive industry. The client was looking for a long-term partner to help them convert all old designs to a new format while also incorporating the new changes as marked by the experts. The challenges involved reading the markings on the legacy files as well as incorporating those to match the new designs and meeting the growing design needs in time to reduce time to market. Outsource2india has provided a number of engineering support services to the global aviation giants and has fair amount of idea on working on these critical parts required for fuel injection systems. The team consisted of 2 mechanical engineers and a quality expert to ensure all the design met the design standards and carried all the change incorporations as required by the client. 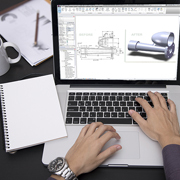 The client provided inventor 2015 files as well as some hand drawings and sketches to be converted to 3D drawings. These drawings needed to meet the Australian standards for this specific project. The client was happy looking at the designs that were designed for easy adaptability as well as to enhance product performance. Outsource2india is a trustworthy engineering support services provider with over two decades of experience in providing mechanical CAD migration and design services. Backed by latest technology expertise and dedicated CAD professionals, O2I adds value in terms of precise and accurate design projects. O2I works as an offsite engineering services partner and takes up complex design and migration projects to offer cost-effective solutions to global clientele. Get in touch with a 3D modeling specialist at O2I to get your project enhanced by out 3D modeling team.